it's so good! can't wait for more to be uploaded! this is awesome!!!!!!!!!!!!!!!!!!!!!!!!! give it 5 stars!!!!!!!!!!!!!!!!!!!!!!!!!!!! My son and I love listening together! Can't wait for more! The oldest known pair of shoes didn’t look like much, but foot fashion has come a long ways since prehistoric sandals. Joy Dolo and her co-host Daria lace up some matching footwear and take a hike through shoe history with reporter Nancy Yang. First stop is the Oregon cave where a 9,000-year-old pair of shoes was discovered. Then, a French king who tried to enforce a monopoly on his signature style, and the inventor who made shoes affordable for everyone. And finally, is the future of shoes… bacteria? This episode is sponsored by Myro (myro.com/forever). You can support Brains On and Forever Ago at brainson.org/donate. Umbrellas have been shielding us from the elements for thousands of years, but they haven’t always been in style. Time-traveling reporter Josie Huang takes Joy Dolo and co-host Bella on a bumpy ride through “brolly” history. We’ll meet the fashion-forward guy who made it cool to carry an umbrella in London, and the savvy sculptor Slawa Duldig, who created a more portable design. Plus, a visit from resident umbrella trend forecaster Sanden Totten. From simple smiley faces to sparkly unicorns, we have a lot of emoji options. But it wasn’t always this way. Joy Dolo and co-host Melissa search for the very first emoji with reporter Elyssa Dudley. They’ll meet the man behind the first emojis designed for cell phones, and visit the early computer lab where smiley faces went viral. Plus, we’ll meet the teenager who created her very own emoji. 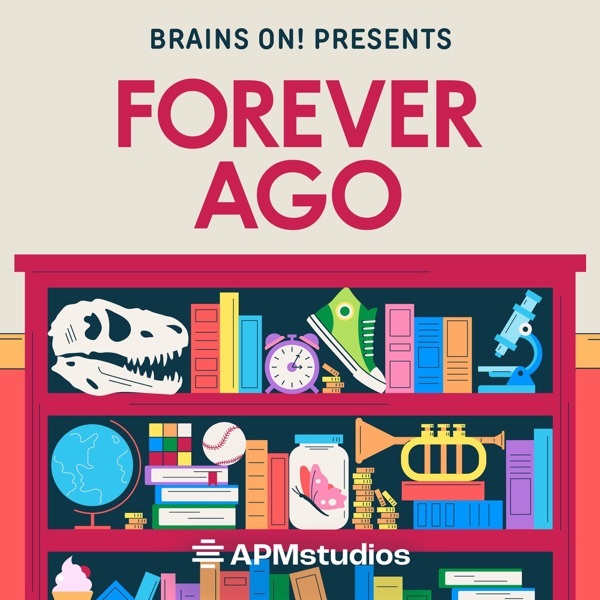 You can support Brains On and Forever Ago at brainson.org/donate. Long before clocks, humans found creative ways to track time. From falling sand to burning incense, we tried it all. But it took a daydreaming astronomer and a whole lot of inventors to get us to the precise clocks we use today. Joy Dolo and co-host Kira set off on a tour of ancient timekeeping devices with reporter Carla Javier. Plus, we’ll learn about a clock buried deep in a mountain side that’s designed to keep ticking for 10,000 years. This episode is sponsored by StoryWorth (storyworth.com/forever). You can support Brains On and Forever Ago at brainson.org/donate. It’s a simple recipe: bread, filling, bread. But sandwiches had to get their scrumptious start somewhere. Joy Dolo and co-host Ben travel back to a time when putting food between two slices of bread was a culinary revolution. Reporter Tracy Mumford introduces us to two innovators duking it out for the credit, and Brains On host Molly Bloom treats us to some strange historical sandwiches, including a sandwich loaf. This episode is sponsored by Hint (drinkhint.com/forever) and Molekule (molekule.com). You can support Brains On and Forever Ago at brainson.org/donate. The first skateboards didn’t come from a store. Kids had to make them from scratch! And they made for a bumpy ride… Joy Dolo and twelve-year-old pro skater Minna kickflip their way through history with reporter Chris Greenspon. We’ll get the scoop on low-tech early skateboards and the skaters who innovated their way to a smoother ride. Plus, we’ll talk with a skater who wants to change the world with four wheels and a deck. You can support Brains On and Forever Ago at brainson.org/donate. Did you know that the ancestor of our smartphone cameras was just a box with a tiny hole in it? This week, Joy Dolo and kid co-host Elena explore the wide world of cameras with the help of reporter Paulina Velasco. Ancient philosophers, French inventors, and one frustrated businessman team up across space and time to bring us the modern camera. And we’ll meet a scientist who wants to use cameras to help the blind see. You can support Brains On and Forever Ago at brainson.org/donate. Video games are a lot older than you probably realize, but it took a long time for them to catch on. Join host Joy Dolo and kid co-host Kai on an epic quest through history to figure out how video games began. With help from intrepid reporter Cari Spivack, they’ll visit the age of dinosaur computers, early arcades and befriend some talking cows. Today’s episode is sponsored by Care/of (takecareof.com). You can support Forever Ago at brainson.org/donate. Forever Ago is a history show for the whole family. Every episode explores the origin of one thing – like sandwiches, video games and clocks – while teaching listeners to think critically about the past. Hosted by Joy Dolo and produced by the team behind Brains On and Smash Boom Best.